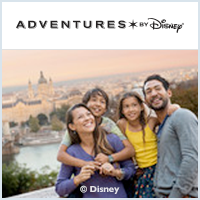 The England and France family vacation from Adventures by Disney begins in jolly old England with a visit to Buckingham Palace and Disney's theatrical production of The Lion King. It then crosses the English Channel to Paris for scavenger hunts in the Louvre, wanders through wondrous Versailles and includes a family lunch in the Eiffel Tower. Oh la la! Feel like a super spy as you jet on the River Thames on a speedboat that would be right at home with Britain's most famous secret agent. Try your hand at a signature English treat with a scone-making lesson and time for Tea! Travel through some of England's lush countryside to a beautiful estate located minutes from historic Windsor. Then, take aim and test your skills as an archer. Marvel at the gargoyles of Nôtre Dame Cathedral. Then, as the adults follow a local expert to view some of the world's greatest masterpieces in the Louvre, Junior Adventurers discover famous art works on an interactive scavenger hunt. After you pick up your luggage and go through customs, an Adventures by Disney representative will meet you at the main terminal and direct you to your transportation. Then, a driver will assist you with your luggage and take you and your family to The Landmark London. Meet the other families that will share this adventure with you. After a festive cocktail reception, gather for an authentic British feast that kicks off a week discovering 2 truly magical countries! Climb aboard an iconic London bus and see the city from a rooftop view on this privately guided tour. Discover the beautiful cathedral that has been the site of coronations, royal weddings and countless historical events, with commentary by a blue badge guide. Enjoy authentic English fare at this fantastic restaurant on the Wharf at the Tower of London, overlooking the Thames. Take this opportunity to meet the famous Beefeater guards at the Tower of London. Also referred to as "Yeomen Warders," they were originally formed in 1485 by Henry VII. Explore this foreboding fortress on a privately guided tour and learn details about its checkered past! Over the ages, the Tower of London has been guardian of the Crown Jewels, home to all manner of beasts—including lions, bears and other predators—as well as prison to the famous and infamous. Feel like a super spy as you jet along the River Thames on a speedboat that Britain's most famous secret agent would feel at home in. All the while, you'll be seeing historical sites and iconic scenery on this special tour of Central London. Adults enjoy dinner at their leisure at the hotel's restaurant and lounge. *This activity is subject to change without notice. Travel to a beautiful estate located minutes from historic Windsor. 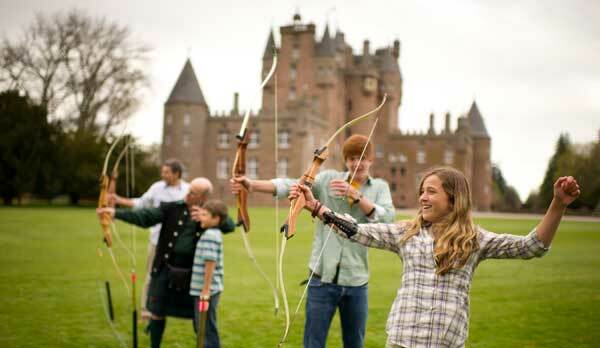 Grab a bow and arrow and test your marksmanship skills. Adults and Junior Adventurers alike will enjoy this test of skill—not to mention the fun they'll have comparing scores with their families. Experience High Tea in Guildhall, a grand setting for glittering banquets with Heads of State, dignitaries and the Royal Family since the 12th century. Learn about this London landmark's history as well as its signature recipes. And take home your own recipe card as well. Watch a scone-making demonstration by the mother-daughter team of "Limes Dine-in Bakery," and then rate your skills when you enjoy the delicious results! Visit this remarkable dollhouse to see one of the world's most incredible collection of dolls. You will return back to the hotel to enjoy dinner and the rest of your evening to explore on your own. Don't forget to ask your Adventure Guides for any restaurant recommendations. Upon arrival in Paris, our local expert will introduce you to Paris, including some of its iconic structures, such as the Eiffel Tower and the Arc de Triomphe. You'll be swept away by the wondrous beauty of the brilliant City of Light as you experience famous sights such as Rue de Rivoli, Place de la Concorde and the Avenue des Champs-Élysées—"the most beautiful avenue in the world." *Minimum age is 6 years old. Spend some time in the lap of luxury. Travel to Versailles to see how the notorious royals, Louis XIV and Marie Antoinette, lived in grandeur! With a private guide, tour the royal apartments and explore this fairy tale palace that dazzles your senses with its gilt ceilings, crystal chandeliers, ornate furniture and famous Hall of Mirrors. Hop on your bicyclette and explore the winding paths of the palace's immense estate. Discover sweeping vistas, twinkling fountains, elaborate hedges, and trees pruned into immaculate sculptures. Enjoy a leisurely lunch overlooking the Grand Canal in the parc of Versailles. This casual restaurant lies in the heart of the dramatic Formal Gardens, with its famous fountains of Neptune and Apollo. Taste 3 spectacular wines, introduced by an English-speaking oenologist in this beautiful restaurant frequented last century by famous artists such as Renoir, Monet, Cézanne, Toulouse-Lautrec and Van Gogh. Junior Adventurers can enjoy grape juice. Now is your chance to venture out and experience the grand French ritual of le dîner! Your Adventure Guides will help you find the perfect restaurant for an extraordinary family meal as only the French can create. Or discover a wonderful restaurant on your own. After breakfast, take a privately guided tour of this cathedral with flying buttresses, soaring spires and grimacing gargoyles. As you climb the bell tower, hear stories about the creation of this architectural masterpiece and be reminded of Victor Hugo's famous book about the legendary hunchback, Quasimodo— which was turned into an animated Disney film, The Hunchback of Notre Dame! In the city where food is an art all its own, you are sure to find a meal to amaze your palate. Feel free to ask your Adventure Guides for restaurant suggestions. Take a water taxi for a trip along the scenic Seine River to the Louvre Museum! It would take more than a lifetime to fully see and appreciate all the artwork within the Louvre. Your private guide and art expert can help illuminate the world's greatest masterpieces, including the enigmatic Mona Lisa. While adults tour the museum, Junior Adventurers can participate in a unique interactive scavenger hunt and uncover clues leading to some of the Louvre's secrets and most famous works of art. 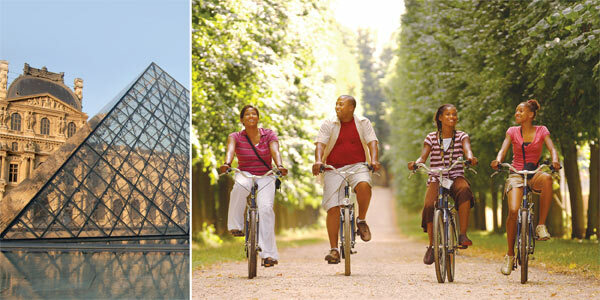 Take in the extraordinary sights and sounds of Paris as you explore this magical city on your own. Choose from the many extraordinary restaurants in this city that's renowned for its culinary excellence. Bon Appétit! Fuel up for an exciting day ahead, beginning with a coach transfer to Le Marais. Follow your local expert on this delicious stroll through the Le Marais district—one of Paris's most charming and historic neighborhoods. We will visit several small specialty shops and try several delectable French treats along the way! Take a break in your tour for lunch in the oldest covered marketplace in Paris. The Marché des Enfants Rouges offers a variety of fresh meals served in stands as well as in nearby bistros. Ask your Adventure Guides for suggestions. Continue your tour of this amazing neighborhood. And enjoy browsing in the boutiques and art galleries. Gather together with your newfound friends and dine in the height of elegance at Ladurée restaurant, home of the famous double-decker macaron. Enjoy iconic French music played by an accordionist. After dinner, relive the memories of your trip as you enjoy a special surprise! Board pre-arranged transportation to the airport and say au revoir until you return again!